375 different locations across the continent. 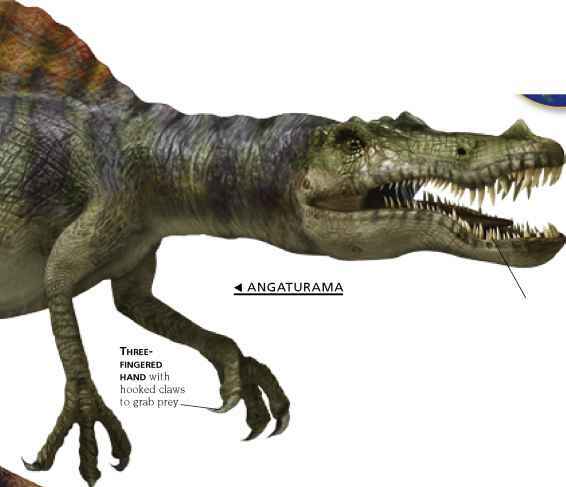 They range in date from the Late Triassic of 225 million years ago to the Late Cretaceous, 65 million years ago. It was in Europe that the curiosity in ancient animal bones first began, and the earliest scientific studies and naming of dinosaurs were carried out here. 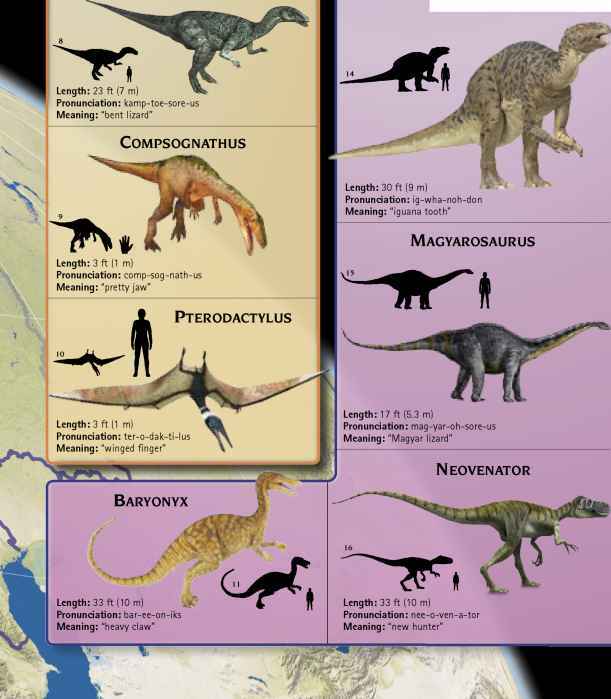 About 80 dinosaur species have so far been identified in the countries of Europe, from small carnivores to the giant plant-eaters of the Jurassic. 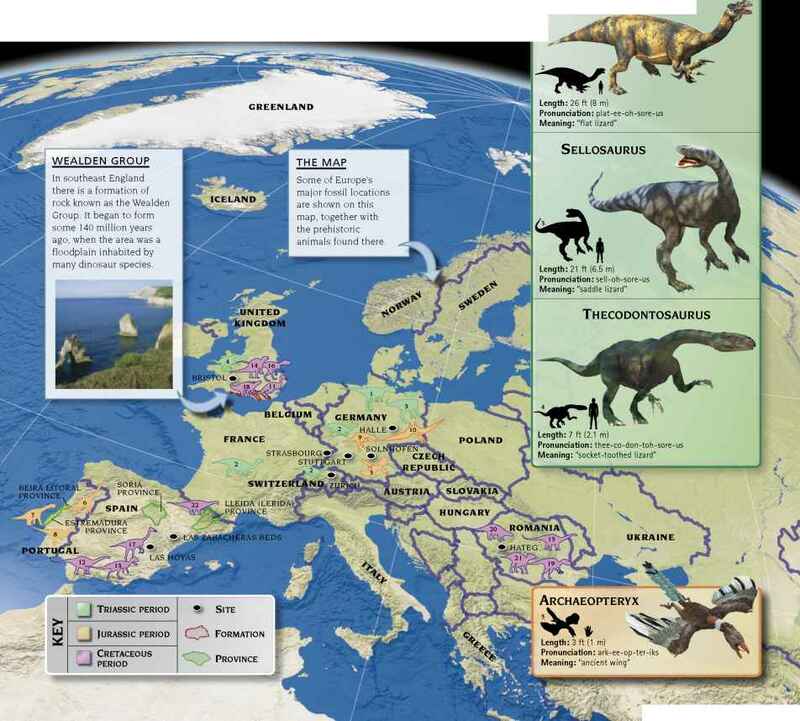 In addition to dinosaurs, Europe's rocks contain other fossils, including a primitive bird and many kinds of pterosaur. All together they reveal just how varied the ancient animal kingdom was. Length: 50 ft (16 m) Pronunciation: brak-ee-oh-sore-us Meaning: "arm lizard"
Length: 39 ft (12 m) Pronunciation: hip-sell-oh-sore-us Meaning: "high-ridged lizard"
Length: 75 ft (23 m) Pronunciation: kam-are-ah-sore-us Meaning: "chambered lizard"
Length: 6% ft (2 m) Pronunciation: hip-sill-oh-fo-don Meaning: "high-ridged tooth"
Length: 6% ft (2 m) Pronunciation: pel-ih-can-ih-mime-us Meaning: "pelican mimic"
Length: 16 ft (5 m) Pronunciation: pol-a-kan-thus Meaning: "many spines"
Length: 15 ft (4.7 m) Pronunciation: rab-doh-don Meaning: "rod tooth"
Length: 6% ft (2 m) Pronunciation: strew-thee-oh-sore-us Meaning: "ostrich lizard"
Length: 17 ft (5 m) Pronunciation: tell-mat-oh-sore-us Meaning: "marsh lizard"
Length: 58 ft (18 m) Pronunciation: ti-tan-oh-sore-us Meaning: "titanic lizard"